What exactly do insects eat? What are bees looking for when they fly from flower to flower? Students compare and contrast insect mouth parts and understand that an insects food is related to its type of mouth part. 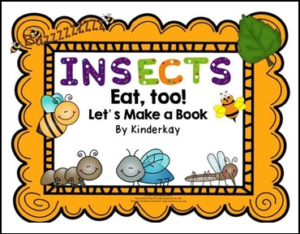 Everyday items are used to give students an understanding of how an insect eats. Students draw four insects bee, fly, mosquito and using easy to follow step-by-step illustrations. Students illustrate the book themselves by using basic drawing and cutting skills. This is a great supplement to your thematic Insect unit! How to draw a bee, an ant, a mosquito, and a fly are included in this unit.